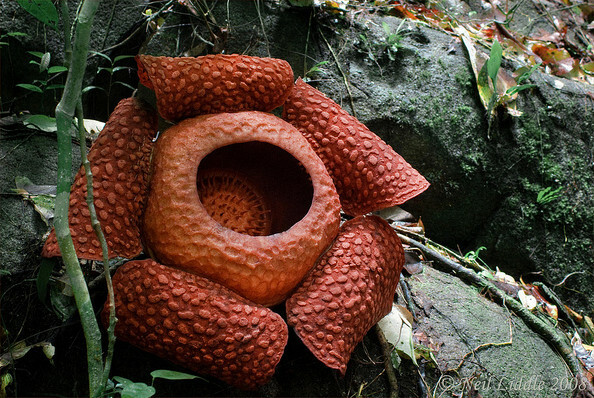 Special Containment Procedures: Due to the restrictive growing conditions of Rafflesia arnoldii, Outpost 2462-0 has been established at SCP-2462's location of discovery to prevent unauthorized access and allow for experimentation. Monetary compensation to the citizens of ██████ has been authorized to prevent the disclosure of SCP-2462's anomalous properties to third parties. A 350m perimeter is to be established around SCP-2462 during its blooming period, with access denied to all unauthorized individuals, save for citizens of ██████ who live, work, or regularly visit inside the perimeter. SCP-2462 is kept at Outpost 2462-0. Four mirrors are to be stationed around SCP-2462, and must be cleaned regularly to maintain reflectivity. Description: SCP-2462 is a genetically unremarkable specimen of Rafflesia arnoldii located outside ██████, Indonesia. While blooming, SCP-2462 generates a variable number of illusory R. arnoldii instances, collectively designated SCP-2462-A, within 250 meters of itself. SCP-2462-A do not displace any matter or have mass of their own, yet are opaque to light and respond realistically to environmental stimuli and physical interaction. Computer analysis of photographed SCP-2462-A has confirmed that they are not hallucinations. Proximity of other R. arnoldii: Each living specimen within line of sight of SCP-2462 results in a ~60% reduction in SCP-2462-A's numbers. Malnourishment: SCP-2462-A production increases by 20-50% in periods where SCP-2462 is malnourished. Light: When illumination of SCP-2462 drops below levels typical of nighttime in its natural environment, SCP-2462-A will triple in number, receding when illumination is restored. Damage: When SCP-2462 is damaged, SCP-2462-A will cover almost every surface within 250 meters of it. SCP-2462-A will recede only when the damage to SCP-2462 is healed. Due to the difficulty of locating and transporting R. arnoldii instances2, containment by the presentation of other R. arnoldii instances is impracticable. Recovery: SCP-2462 was identified in 2008, after photographs of SCP-2462-A were published on the official ██████ tourism website. Interviews with citizens of ██████ indicate that SCP-2462 has been exhibiting anomalous properties since the previous year, with SCP-2462-A affecting two neighborhoods on the town's outskirts. Turning SCP-2462-A into a tourist attraction had only been considered in the months preceding SCP-2462's 2008 bloom. Addendum: At the recommendation of Dr. Breitkopf, SCP-2462 was surrounded by four mirrors, producing an effectively unlimited number of reflections, during a blooming period. SCP-2462-A was not generated. SCP-2462 was downgraded to Safe, and containment procedures were adjusted accordingly. 1. Roughly one per 6.5m2 over its whole active radius. 2. R. arnoldii exists as a parasite on the roots of the Tetrastigma genus, and has not been successfully cultivated in captivity. It is not visible to the naked eye outside of its brief annual blooming period. Moreover, R. arnoldii is critically endangered due to deforestation — SCP-2462 is the only known member of its species within a 36km radius.